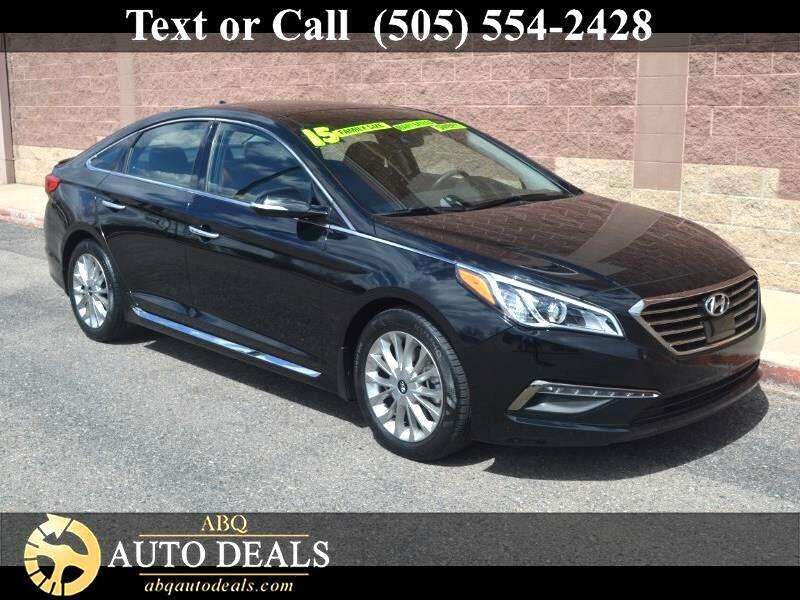 Our impressive One Owner, Accident Free 2015 Hyundai Sonata Limited Sedan is shown in beautiful Phantom Black. Powered by an efficient 2.4 Liter 4 Cylinder which produces a mighty 185hp while mated to a durable 6 Speed Automatic transmission featuring Shiftronic. This Front Wheel Drive Limited is fun to drive and offers near 35mpg on the highway. Alloy wheels, a rear lip spoiler, projector headlights, LED daytime running lights, LED taillights, a panoramic sunroof, and chrome-tipped dual exhaust accent the stylish exterior. Inside our Limited, the spacious leather-trimmed cabin features a proximity key w/push-button start, power windows and door locks, dual-zone automatic climate control, power-adjustable heated and ventilated leather front seats, a heated leather-wrapped steering wheel with mounted controls, and the Hyundai BlueLink system that features premium Infinity sound, Bluetooth, available SiriusXM radio, Navigation to help you with your route, available WiFi, and a color touchscreen display. Our cabin features class-leading space and a multitude of premium soft-touch materials. Of course, our Hyundai Sonata would not be complete without a vast array of innovative safety features. Seven airbags, including a driver's knee airbag, a rear view camera, Vehicle Stability Management System, a Tire Pressure Monitoring System w/Individual tire pressure monitors and front/rear crumple zones are just a few of these features surrounding you and your passengers. The only thing standing between you and our sophisticated and American-made Sonata is the print button. Print this page and call us Now... We Know You Will Enjoy Your Test Drive Towards Ownership! Your buying experience with ABQ Auto Deals is our number one priority.